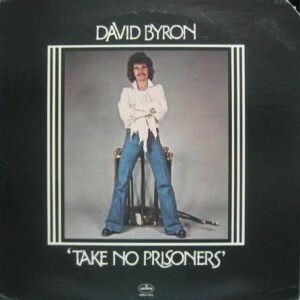 “Take No Prisoners” is the first solo album that David Byron recorded while still working with Uriah Heep. The album was recorded in February 1975 at Morgan and Roundhouse Studios (the latter was owned by Gerry Bron) and mixed at Roundhouse. “Take No Prisoners” was released in March 1975 by Bronze Records. The UK and US releases had different covers. All members of Uriah Heep, including the bass player John Wetton, participated in the recording sessions. Also there were guest musicians, the old friends of David’s — Pete Thompson, Denny Ball and Lou Stonebridge. Producers — Peter Gallen and David Byron. Assistant engineers — Dave Harris (Morgan), Trevor Hallesy and John Gallen (Roundhouse).